The Pope chose to visit the Italian seaside town of Loreto on the March 25 feast day to sign his postsynodal apostolic exhortation — titled in Spanish, Vive Cristo, esperanza nuestra, (Christ, Our Hope, Lives). The document, based on discussions and input garnered from the world 2018 Synod of Bishops on “young people, faith and vocational discernment,” will be released to the public on April 2, the anniversary of the death of St John Paul II. The intention is “to connect two pontificates, so loved and close to the younger generations,” said Alessandro Gisotti, interim director of the Vatican press office. 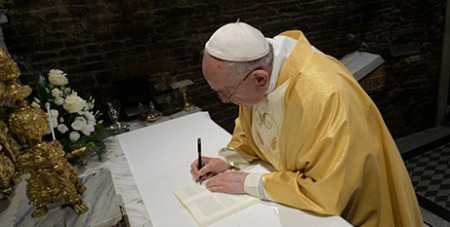 Francis signed the document at the altar inside the small, one-room Holy House of Loreto, which tradition holds is where Mary was born and raised and where the Holy Family was thought to have lived when Jesus was a boy. It also is held to be the place where Mary received the angel’s annunciation and conceived the Son of God through the Holy Spirit. In his talk to those gathered in the square in front of the basilica housing the sanctuary, the Pontiff said he wanted to sign the document on the date and at the place of the Annunciation to highlight how the Annunciation reveals what is necessary in the vocational process: listening to God’s word and God’s will, inquisitive discernment and bold decision-making.